INsights - Consumer Neuroscience in Business (formerly known as Neuromarketing Theory and Practice) is the quarterly magazine of the NMSBA, exclusively available to NMSBA members. 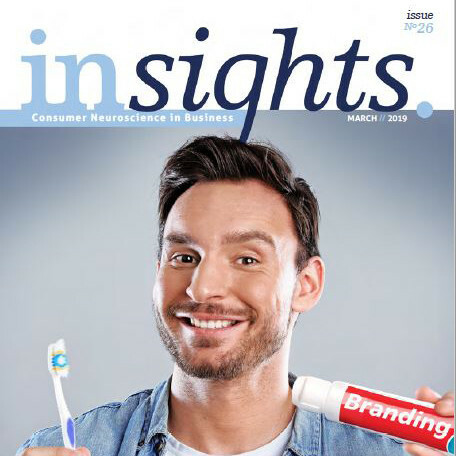 INsights is the world’s only publication on consumer neuroscience applied in business. No neuromarketing-voodoo – just solid scientific principles and methodologies, applied to real business scenarios. In each issue, leading neuroscientists and market researchers present the latest neuroscience findings and help readers address pressing marketing challenges. Each issue is focused on a current theme, such as emotional marketing, online shopping, trust, and consumer senses. INsights is read by neuromarketing professionals around the world. Of course, it wouldn't be such a popular quarterly without a dedicated editorial board. New! Corporate or corporate vendor members now have immediate online access to all INsights issues via the INsights archive! Not a member yet? Join today! Would you like to contribute? INsights encourages the submission of articles that bear directly on neuroscience theory and issues and the application of neuroscience in business practice. Find out about past and upcoming themes and submission deadlines here. Download the submission guidelines and send your article to insights@nmsba.com. Want to be top-of-mind in the international community of neuromarketing researchers, practitioners, and academics? Advertise in INsights and create more awareness for your business. View the promotional opportunities page, or contact Sara Hoeflaken directly.